NAPSA was founded in 2010 by the directors of seven of the leading chimpanzee sanctuaries on the continent. With chimpanzees as the common denominator among the founding members, and the atmosphere of hope surrounding the end of use of chimps in biomedical research and the entertainment industry, the early focus of NAPSA was on chimp-related issues. However, with the construction of the organization’s infrastructure complete, NAPSA has expanded its ranks by accepting applications for membership from primate sanctuaries across the continent. NAPSA was formed to share information, experience, policies and procedures, in an effort to increase the success of each member sanctuary. It also serves as a central point of contact and expertise for issues relating to captive primates. Each full member sanctuary is licensed and inspected by the United States Department of Agriculture (or its Canadian equivalent), licensed by relevant state and county authorities, and either fully accredited by the Global Federation of Animal Sanctuaries or certified by the Association of Zoos and Aquariums. NAPSA is governed by a Steering Committee made up of representatives from organizations with full membership. Read bios of our Steering Committee. NAPSA is a fiscally sponsored project of Community Initiatives, an Oakland, CA-based 501(c)(3) non-profit organization. Initial funding for NAPSA was provided by the Arcus Foundation, the New England Anti-Vivisection Society and the Park Foundation. NAPSA is grateful for the following people who serve on its Council of Professionals. 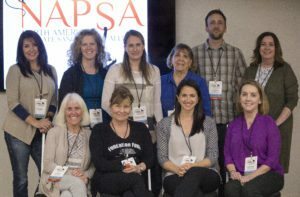 The Council consists of thoughtful leaders from the primate protection community and beyond who advise NAPSA members and staff as needed. The Council does not direct NAPSA’s daily activities. Professional affiliations are listed for informational purposes only.